Color White to grey, light blue, orange to red, black. Fracture Conchoidal with very sharp edges. Agate is a type of quartz (silica), chiefly chalcedony, characterized by its fine grain and bright colors. Although agates may be found in various types of rock, they are especially common in metamorphic rock. The colorful agate and other chalcedonies were obtained over 3,000 years ago from the Achates River (now called the Drillo) in Sicily. Agates have been used in history to make both ornamental objects and practical items, including brooches, paper knives, inkstands, and seals. In addition, they have been useful for making mortars and pestles to crush and mix chemicals. Banded agate (agate-like onyx). This specimen is 2.5 cm (1 inch) wide. Most agates occur as nodules in volcanic rocks or ancient lavas. It is thought that after volatile materials have separated from the molten mass, they leave behind cavities (or "vapor-vesicles") that are then filled by the layered deposition of siliceous (silica-containing) matter on the walls. 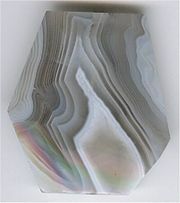 Such agates, when cut transversely, exhibit a succession of parallel lines, giving a banded appearance to the section. 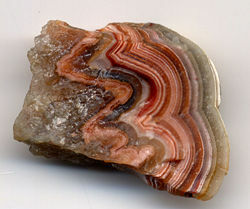 Such stones are known as banded agate, riband agate, and striped agate. In the formation of an ordinary agate, it is probable that waters containing silica in solution percolated through the rock and deposited a siliceous coating within the vapor-vesicles. Variations in the composition of the solution or the conditions of deposit may cause corresponding variation in the successive layers. As a result, bands of chalcedony often alternate with layers of crystalline quartz. Many agates are hollow, because deposition has not proceeded far enough to fill the cavity. In such cases, the last deposit commonly consists of quartz, often amethyst, in which the apices of the crystals are directed toward the free space. Such a specimen, with a crystal-lined cavity, is called a geode. Occasionally, several vapor-vesicles may unite while the rock is viscous, forming a large cavity that becomes the home of an agate of exceptional size. For instance, a Brazilian geode lined with amethyst and weighing 67 tons was exhibited at the Dusseldorf Exhibition of 1902. The first deposit on the wall of a cavity, forming the "skin" of the agate, is generally a dark greenish mineral substance, like celadonite, delessite, or "green earth." These materials are rich in iron, probably derived from the decomposition of augite in the enclosing volcanic rock. The green silicate may be altered to a brown iron oxide (limonite), giving a rusty appearance to the outside of the agate-nodule. When the matrix in which an agate is embedded disintegrates, the agate is set free. Its outer surface is often pitted and rough. Agates are extremely resistant to weathering and remain as nodules in the soil or are deposited as gravel in streams and shorelines. A Mexican agate, showing only a single eye, has received the name of "cyclops agate." 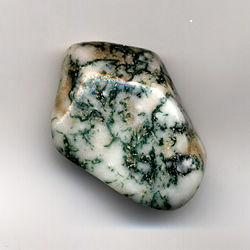 Included matter of a green, golden, red, black or other color or combinations embedded in the chalcedony and disposed in filaments and other forms suggestive of vegetable growth, gives rise to dendritic or moss agate (named varieties include Maury Mountain, Richardson Ranch, Sheep Creek and others). Dendritic agates have beautiful fern like patterns on them formed due to the presence of manganese and iron ions. Other types of included matter deposited during agate-building include sagenitic growths (radial mineral crystals) and chunks of entrapped detritus (such as sand, ash, or mud). Occasionally agate fills a void left by decomposed vegetative material such as a tree limb or root and is called limb cast agate due to its appearance. Turritella agate is formed from fossil Turritella shells silicified in a chalcedony base. Turritella are spiral marine gastropods having elongated, spiral shells composed of many whorls. Similarly, coral, petrified wood and other organic remains or porous rocks can also become agatized. Agatized coral is often referred to as Petoskey agate or stone. Greek agate is a name given to pale white to tan-colored agate found in Sicily back to 400 B.C.E. The Greeks used it for making jewelry and beads. Today any agate of this color from Greek/Sicily area of the Mediterranean is called Greek agate. Other forms of agate include carnelian agate (usually exhibiting reddish hues), Botswana agate, Ellensburg blue agate, blue lace agate, plume agate (such as Carey, Graveyard Point, Sage, Saint Johns, Teeter Ranch and others), tube agate (with visible flow channels), fortification agate (which exhibit little or no layered structure), fire agate (which seems to glow internally like an opal) and Mexican crazy-lace agate (which exhibits an often brightly colored, complex banded pattern). In many traditions, agate was believed to cure the stings of scorpions and the bites of snakes, soothe the mind, prevent contagion, still thunder and lightning, promote eloquence, secure the favor of the powerful, and bring victory over enemies. Some have thought that agate has powers that can be used for love, mental clarity, and good luck in card games. In addition, Persian magi are known to have prized agate rings in their work and beliefs. Shi'a Muslims often wear an agate ring on the right hand, the stone engraved with the name of Allah, Ali, or the names of the other eleven Imams. It is known as "aqaq" or "agag" in Persian. 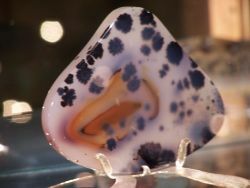 Agates are used to make ornamental objects such as pins and brooches, and items with practical uses such as paper knives, inkstands, and seals. In addition, because of its hardness and ability to resist acids, agate is used to make mortars and pestles to crush and mix chemicals. ↑ Paul Howard, Adapted from Australian Gemmologist (1996)Agate Creek Agate. Gemmological Association of Australia 2005. Retrieved September 24, 2007. The Nomenclature of Silica. American Mineralogist. Agate: Banded Beauty. International Colored Gemstone Association.